The Boxing Truth®: Should Golovkin Face The Winner Of Potential Martinez-Cotto Clash? Should Golovkin Face The Winner Of Potential Martinez-Cotto Clash? Undefeated unified WBA/IBO Middleweight world champion Gennady Golovkin clearly has established himself as one of Boxing’s hottest rising stars. Coming off an extremely active 2013 where Golovkin scored four impressive knockout victories in title defenses over Gabriel Rosado, Nobuhiro Ishida, Matthew Macklin, and Curtis Stevens there was little doubt that anticipation of a unification showdown with WBC world champion Sergio Martinez who is widely considered the number one fighter in the Middleweight division would gradually begin to stir. It is not hard to understand why there would be an anticipatory feeling among Boxing experts and fans alike of what would surely be a potential big money pay-per-view attraction. From a promotional standpoint the idea of Martinez, who has been at or near the top of the division since defeating Kelly Pavlik for his first Middleweight world championship in 2010 facing a fighter with a near 90% career knockout percentage and a 100% knockout percentage in Middleweight championship fights, is certainly an intriguing sales hook. Could Martinez do what no fighter has been able to do in nearly six years, survive the come forward, constant pressure seek and destroy style of Gennady Golovkin? Following Golovkin’s knockout win over a very “Game” Curtis Stevens in his ninth title defense last November, this observer said that it is likely that many would assume that a potential fight between Golovkin and Martinez would take place sometime in 2014. As Golovkin began his 2014 campaign when he faced contender Osumanu Adama on February 1st in Monte Carlo, Monaco the champion picked up from where he left off at the end of 2013, applying consistent pressure and gradually breaking his opponent down in scoring three knockdowns in route to a seventh round stoppage. Adama was quite “Game”, but was overmatched against the champion who scored his sixteenth consecutive knockout victory in his tenth successful title defense. There was nothing to suggest that an inevitable collision between Golovkin and Martinez is not in the cards at some point in the future. It would appear however, that Martinez will next face former multi-division world champion Miguel Cotto in June. There is no doubt that a fight between Martinez and Cotto in it’s own right presents a big money pay-per-view draw that will no doubt garner considerable attention. No matter the result of that fight should it take place, one might argue that it does present what could be viewed as a win/win for Golovkin. Both are stars in the sport and each fighter presents a lucrative opportunity for a fighter in Golovkin’s position. There is little doubt that Golovkin could be viewed by some as the man who will take over the number one position in the Middleweight division as Sergio Martinez could be nearing retirement in the not too distant future. Although it is clear in this observer’s mind that Golovkin would be the logical option for the potential Martinez-Cotto winner there are certainly more options on the table. 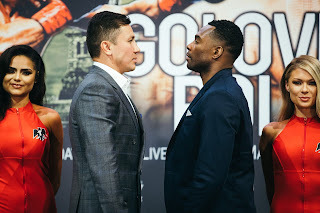 Golovkin has clearly established himself as not just a star of the sport, but also one of the most active world champions in the sport having fought seven fights in the last two years including his knockout win over Adama last weekend. For a fighter who is on the top level of the sport to be so active is rare in the modern era. Of course one would likely say that Golovkin’s frequent activity can easily be attributed to the fact that he has not been forced to go a full twelve rounds thus far in his career and thus he has not sustained much punishment which would allow him to fight more frequently. It is indeed true that Golovkin has not had to go deep into fights in fights that have been scheduled for a twelve round distance. The only fighter to extend the champion as far as ten rounds was former Jr. Middleweight world champion Kassim Ouma who was stopped in ten by Golovkin in 2011. In the past I have commented that the scenario that Golovkin finds himself in has reminded me of Marvelous Marvin Hagler who found himself in the same position after winning the World Middleweight Championship from Alan Minter in 1980. Along with the similarity of both Golovkin’s and Hagler’s knockout streaks, Hagler was also a very active champion successfully defending his title eleven times between 1981 and 1987. As I have said in the past Hagler was also in a position one might argue that he had to literally destroy his division before he was able to secure big money fights against fellow top stars of his era, Roberto Duran, Thomas Hearns, and finally Sugar Ray Leonard. Currently Golovkin has been able to successfully defend his title ten times in almost four years and has partially unified the title. It is only a matter of time in this observer’s eyes before Golovkin will get those marquee fights against top stars. As for what the other options are while waiting for the potential winner of the Martinez-Cotto showdown? It has widely been reported that Golovkin would like to fight in April at Madison Square Garden in New York. Although names such as former IBF Middleweight world champion Daniel Geale, and top contender and former world title challenger Andy Lee have been mentioned as possible opponents, a fight that does present some intrigue could be a unification bout with three-time Middleweight world champion Felix Sturm. Sturm recently won the IBF crown by scoring a second round knockout over champion Darren Barker in December. Sturm has been one of the top stars of the German Boxing scene for much of the last decade and a cornerstone of the Middleweight division. Most will remember Sturm’s only appearance in the United States when he lost his WBO world championship in a disputed decision to Oscar De La Hoya nearly ten years ago. A fight that many observers, this one included felt Sturm had won. One could speculate that the reason Felix Sturm has not fought in the United States since that fight in June of 2004 could well be that he felt that he had gotten robbed in that fight and potentially did not want to risk coming back to the United States possibly for fear of not getting a fair shake from judges who score the fights. Whether or not that is the case is only a question that Felix Sturm can answer. Sturm however, has rightfully earned his place as a top Middleweight of his era and I believe should be given an opportunity to unify his title. It would also do Sturm well if he were to fight Golovkin outside of Germany, potentially in the United States. Although it is certainly understandable how a questionable decision could leave a bad taste in a fighter’s mouth, I believe Felix Sturm should be given another opportunity to show American Boxing fans what he can do by fighting in the United States. Whether or not there has been any consideration of Sturm as a potential opponent for Golovkin is speculation, but a fight between the two does seem attractive at least in my eyes. Even though it is my opinion that Golovkin would be the logical opponent for the winner of the potential Martinez-Cotto clash, it will be interesting to see whomever Golovkin should face next whether or not that fighter can throw a monkey wrench into any plans Golovkin could have for potential big money fights down the road. If there is a Middleweight out there that can truly test Golovkin, it still remains to be seen.